Christmas themed craft die featuring Birdhouses. CottageCutz are thin metal dies. They are easy-to-use and add great detail to any craft project. Made in the USA. 100% lead free. Christmas themed craft die from Sara Davies featuring a pair of owls. Pack includes 1 metal die. Approximate die size is 3.2" x 3" (82mm x 77mm). Craft die with coordinating stamps featuring a penguin, a snowflake, a candy cane, "Warmest Holiday Wishes", and "Be Merry". Hero Arts Stamp and Cuts are a collection of clear stamps centered around a common theme combined with a coordinating metal die-cut. Stamp first and then cut out using your favorite die-cutting machine. Both stamps and dies are made in the USA. Christmas Themed Penny Black Craft Die featuring icicles and Christmas Lights. Christmas themed paper craft die featuring the 3 Wise Men. CottageCutz are thin metal dies, like a QuicKutz. They are easy-to-use and add great detail to any craft project. Made in the USA. 100% lead free. Pretty and innovative cutting dies to help you create beautiful cards, scrapbook pages and other handcrafted projects! Can be used with most die cutting machines. Christmas themed Hero Arts craft dies featuring animals for a Nativity scene. American-made, precision-etched metal dies create perfect cut-outs using your favorite cutting machine. Christmas themed Penny Black Creative Die featuring a village, a church, snowflakes, and more. Christmas themed craft die featuring a bake shop. CottageCutz metal dies are universal, easy to use and add great detail to any craft project. They are compatible with most brands of die-cutting machines. Adapters and shims may be required on some machines. Use with paper, cardstock, vinyl, vellum, adhesive-back paper and more. Made in the USA and 100% lead-free. This Die-namics coordinates with the Beary Best Friends stamp set for perfectly sized die cuts every time. It is open inside to allow you to stamp then cut OR cut then stamp. This feature makes the Die-namics lighter weight and allows for easier removal from the die. MFT Die-namics, our very own exclusive American-made line of steel dies. 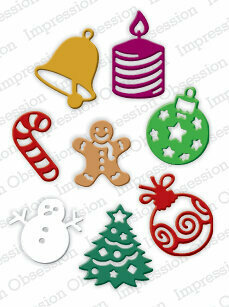 Craft die from Impression Obsession featuring Christmas icons. This is a set of 11 dies. The dies are approximately 1 inch. These are US-made steel dies compatible with most table-top die cutting machines. 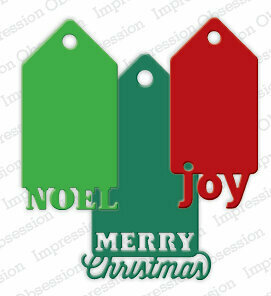 Craft die from Impression Obsession featuring Christmas Bells. This is a single die measuring 2-5/8 x 3-1/2 inches. These are US-made steel dies compatible with most table-top die cutting machines. 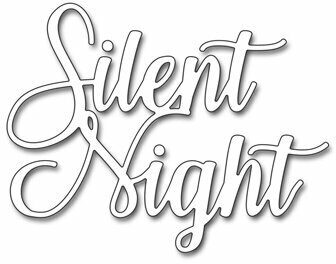 Christmas themed Penny Black Creative Die featuring a Berry Flourish. Our Bethlehem Edger die features a beautiful middle eastern scene. It's a perfect backdrop for Christmas cards. We recommend our Joseph and Mary die (FRA9654), our Nativity Creche die (FRA9245) or our Three Wise Men Silhouette (FRA9244) as complements to the Bethlehem edger. This edger die measures 6" long x 1.25" tall. Edger dies only cut the top part of the design, not the bottom, giving you the option of making the cut portion as tall as you wish. Also, because this die is 6" long, you can use different sections of the design on your card for different looks. For example, use the left portion as one layer, then the right portion as another staggered layer for depth and dimension. Frantic Stamper Precision Dies are proudly made in the USA! Our dies work in all table top consumer die cutting machines. For mixed media, paper arts, card making, stenciling, scrapbooking, mono printing, spraying, spritzing, chalking, and more. Christmas themed Penny Black die featuring the sentiment "silent night". Christmas themed craft die from Sara Davies featuring a festive snowman. Pack includes 9 metal dies. Finished die size is 2.3" x 2.8" (61mm x 73mm). Craft dies featuring a Christmas Tree and a balloon. Lawn Cuts custom craft dies are high-quality steel, made in the USA, and are compatible with most die cutting machines! Made with care in the USA! Christmas themed craft die featuring Christmas Ornaments. Christmas themed craft die featuring borders with snowflakes, holly leaves, and Christmas Trees. Candles have been used as part of Christmas and winter decorations for centuries, bringing light and warmth into homes. This die measures 2.625" x 2.125" and features a lit candle nestled among pine and holly sprigs. Christmas themed craft die from Poppystamps and Memory Box featuring reindeer, Santa's sleigh, Christmas presents, and more. Memory Box/Poppy Stamps craft dies are made of 100% steel. For use on cardstock, felt, and fabric. Cut, stencil, emboss, create! Use in most leading die cut systems. 12 dies included. This is a set of 8 dies. They measure approximately 1" each on their longest side. These are US-made steel dies compatible with most table-top die cutting machines. Christmas themed craft die featuring mice on a park bench. CottageCutz metal dies are universal, easy to use and add great detail to any craft project. They are compatible with most brands of die-cutting machines. Adapters and shims may be required on some machines. Use with paper, cardstock, vinyl, vellum, adhesive-back paper and more. Made in the USA and 100% lead-free. Crafty-Ann craft die featuring a Christmas Ornament. Size: 2 5/8" x 3" (65mm x 77mm). Christmas themed craft die featuring a penguin and a Christmas Tree. Christmas themed craft die featuring Reindeer. Pretty and innovative cutting dies to help you create beautiful cards, scrapbook pages and other handcrafted projects! Can be used with most die cutting machines. Christmas themed Impression Obsession craft die featuring the words "Merry Christmas", "Happy Holidays", "Season's Greetings", "Bright", "Wishes", and "Joy". Christmas themed 6" x 6" paper pad from Amy Design. 23 sheets, double sided. 170 gr. Craft die from Hero Arts featuring a Christmas tree. Coordinates with S6252 Classic Christmas Tree. Christmas themed craft die featuring a snowman and a cup of cocoa. 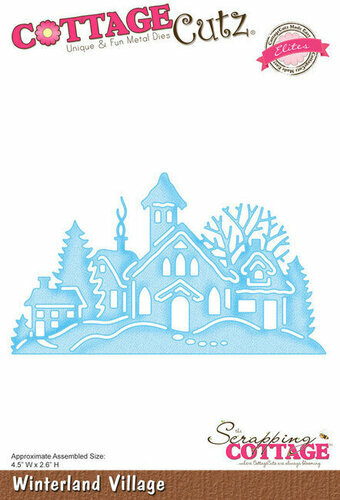 CottageCutz metal dies are universal, easy to use and add great detail to any craft project. They are compatible with most brands of die-cutting machines. Adapters and shims may be required on some machines. Use with paper, cardstock, vinyl, vellum, adhesive-back paper and more. Made in the USA and 100% lead-free. Christmas themed craft die featuring coffee and cocoa. CottageCutz metal dies are universal, easy to use and add great detail to any craft project. They are compatible with most brands of die-cutting machines. Adapters and shims may be required on some machines. Use with paper, cardstock, vinyl, vellum, adhesive-back paper and more. Made in the USA and 100% lead-free. Christmas or Winter themed craft die featuring a frame with snowflakes. Pretty and innovative cutting dies to help you create beautiful cards, scrapbook pages and other handcrafted projects! Can be used with most die cutting machines. CottageCutz are thin metal dies, like a QuicKutz. They are easy-to-use and add great detail to any craft project. This die is compatible with the following machines: QuicKutz Squeeze, Revolution, Sizzix / Ellison Big Shot, BigKick, CuttleBug, SpellBinder Wizard and Accucut Zip'eMate. Adapters/shim may be required on some machines. Made in the USA. 100% lead free. Christmas themed craft die featuring a pair of young deer. CottageCutz are thin metal dies that cut amazing shapes out of paper, cardstock, adhesive-backed paper, vinyl, vellum and more. They are made from American steel and are universal dies designed to work with all leading brand die-cutting machines on the market. Craft dies featuring Christmas desserts. CottageCutz metal dies are universal, easy to use and add great detail to any craft project. They are compatible with most brands of die-cutting machines. Adapters and shims may be required on some machines. Use with paper, cardstock, vinyl, vellum, adhesive-back paper and more. Made in the USA and 100% lead-free. Craft die featuring a Christmas Ornament with a deer among trees. All of the CottageCutz metal dies are universal, easy to use and add great detail to any craft project. They are compatible with most brands of die-cutting machines. Adapters and shims may be required on some machines. Use with paper, cardstock, vinyl, vellum, adhesive-back paper and more. Made in the USA and 100% lead-free. Christmas themed paper craft die featuring a Lantern With Pine Boughs. CottageCutz are thin metal dies, like a QuicKutz. They are easy-to-use and add great detail to any craft project. This die is compatible with the following machines: QuicKutz Squeeze, Revolution, Sizzix / Ellison Big Shot, BigKick, CuttleBug, SpellBinder Wizard and Accucut Zip'eMate. Adapters/shim may be required on some machines. Made in the USA. 100% lead free. Craft die featuring a Christmas Nativity scene. All of the CottageCutz metal dies are universal, easy to use and add great detail to any craft project. They are compatible with most brands of die-cutting machines. Adapters and shims may be required on some machines. Use with paper, cardstock, vinyl, vellum, adhesive-back paper and more. Made in the USA and 100% lead-free. This CottageCutz die features a Christmas Ornament with a Nativity scene. CottageCutz are thin metal dies, like a QuicKutz. They are easy-to-use and add great detail to any craft project. This die is compatible with the following machines: QuicKutz Squeeze, Revolution, Sizzix / Ellison Big Shot, BigKick, CuttleBug, SpellBinder Wizard and Accucut Zip'eMate. Adapters/shim may be required on some machines. Made in the USA. 100% lead free. Craft die featuring Santa Claus Napping. CottageCutz are thin metal dies, like a QuicKutz. They are easy-to-use and add great detail to any craft project. They are compatible with most brands of die-cutting machines. Adapters and shims may be required on some machines. Use with paper, cardstock, vinyl, vellum, adhesive-back paper and more. Made in the USA and 100% lead-free. Christmas themed CottageCutz craft die featuring wrapped presents. CottageCutz are thin metal dies, like a QuicKutz. They are easy-to-use and add great detail to any craft project. This die is compatible with the following machines: QuicKutz Squeeze, Revolution, Sizzix / Ellison Big Shot, BigKick, CuttleBug, SpellBinder Wizard and Accucut Zip'eMate. Adapters/shim may be required on some machines. Made in the USA. 100% lead free. Craft die featuring a Christmas Tree. CottageCutz are thin metal dies, like a QuicKutz. They are easy-to-use and add great detail to any craft project. They are compatible with most brands of die-cutting machines. Adapters and shims may be required on some machines. Use with paper, cardstock, vinyl, vellum, adhesive-back paper and more. Made in the USA and 100% lead-free. Christmas themed craft die featuring a car decorated for Christmas. CottageCutz are universal wafer-thin dies that make a great addition to your paper crafting supplies. Cut amazing shapes out of paper, cardstock, adhesive-backed paper, vinyl, vellum and more. They are made from American steel and are universal dies designed to work with all leading brand die-cutting machines on the market. Elite dies are one-cut, "Made Easy" intricate designs that do not require the use of ejection foam. The die has a special coating that helps eject the paper out of the die easily. Christmas themed embossing folder featuring the sentiment "Happy Holidays". Fantastic value 5in x 7in 3D embossing folder. Works perfectly with most leading brand machines. Add texture & style to all your cardmaking projects. Add incredible depth and dimension to your craft projects with these 3D embossing folders, use them with a variety of different materials for stunning dimensional effects. This embossing folder measures 5" x 7" and is called English Rose. Christmas themed embossing folder featuring the sentiment "Peace On Earth". Fantastic value 5in x 7in 3D embossing folder. Works perfectly with most leading brand machines. Add texture & style to all your cardmaking projects. Add incredible depth and dimension to your craft projects with these 3D embossing folders, use them with a variety of different materials for stunning dimensional effects.